The Whistler Mountain Bike Park is currently closed. The Bike Park is scheduled to open for the summer 2019 season on May 17, 2019. Visit Hours of Operation for dates and opening / closing times. Please note: Tickets booked online must be booked at least 3 days prior to your arrival. All prices quoted are in Canadian dollars. Taxes and fees are extra. Downhill specific bikes are recommended for Whistler Bike Park and are suitable for all ability levels. A good downhill bike provides a good mix of stability and playfulness, allowing you to have a fun and safe experience in the park. Standard downhill fleet bikes are available for rent as well as high performance or premium downhill bikes. Junior sizes are also available. Search below to see all available downhill rental options. Select the duration of rental during the booking process. Protection gear is recommended for the Bike Park. AGES: 17+. Do you have mountain bike experience on trails (downhill or cross country)? If yes, then a half or full day program may be all that you need to get started in the Whistler Mountain Bike Park. Full day bike park lessons run daily at 10:30 AM. AGES: 17+. Whether its a dialing in corners, or practicing pressure control and balance on your bike, a half-day lesson is enough to shake off some of the rust, and get you excited about riding downhill. Half day bike park lessons start at either 10:30am or 2pm and run for 3 hours. Max 4 riders per group. 3 Day Special - Buy 2 full Day lessons and get the third day free! AGES: 17+. 3 day special is only available when taking lessons over 3 consecutive days. AGES: 17+. The perfect program for beginner riders who would like an introduction to the Whistler Blackcomb Bike Park. If you feel confident on a bike but have never ridden in the Bike Park before, Bike Park 101 will have you off and running in no time. This package includes 3 runs down the park only. Lessons run daily at 10:30 AM (May 19 - October 9, 2017) or 1:00 PM & 3:30 PM (June 11 - September 4, 2017). AGES: 5 - 12. The kids camp program offers lessons that will provide your children with the fundamental foundations to the sport, in groups that are suitable for any level of experience. 1, 2 & 3 day camps are available with lunch included. Maximum of 4 riders per group. Lessons run from 9:30 AM - 3:15 PM. AGES: 13 - 16. The youth camp program offers lessons that will provide your children with the fundamental foundations to the sport, in groups that are suitable for any level of experience. 1, 2 & 3 day camps are available with lunch included. Maximum of 4 riders per group. Lessons run from 9:30 AM - 3:15 PM. AGES: 5 - 12. The groups will split their time between riding cross country on Monday, Wednesday and Friday and downhill on Tuesday and Thursday. Groups will ride all the over the valley experiencing all the trails Whistler has to offer during the Cross Country portion and once riders are ready will move into the Whistler Bike Park to develop their downhill skills. Under the guidance of our esteemed and professionally certified coaches, there is no better way for your child to experience the thrill of mountain biking in a supervised and controlled environment. Camps run Monday weekly from June 26 - September 1, 2017. AGES: 5 - 99. The ultimate day of learning can be achieved with a private lesson. Whether it's with a group of your best friends, or you want to tackle the world of mountain biking one on one, your private coach can tailor a program specifically to meet your learning needs. Year after year, our private lessons deliver the highest levels of coaching, personalizing your progression on your bike to maximize your skill development. No matter what your experience level, our coaches will leave you itching for more. Coaching you on any trail, through any feature on the mountain, we ensure you'll be riding better and with more confidence. 3 or 6 hour private lessons are available. Reduced lift ticket rates are available for guests who book prive lessons. Call 1.800.944.7853 to enquire. Please note: Lessons booked online must be made at least 7 days prior to your arrival. Call toll free 1.800.944.7853 to book Lessons within the next two days. 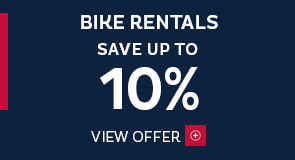 Book by May 31, 2019 and save 10%. Valid for tours departing May 1 - September 30, 2019. 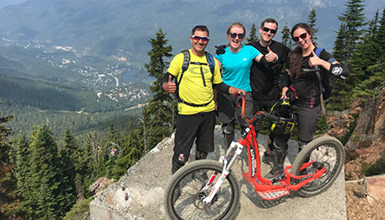 Since opening, the Whistler Mountain Bike Park has led the charge in downhill mountain biking, pushing gravity-fuelled riding to new heights. Entrenched as an instutution in the mountain biking scene, riders from all around the world make the pilgrimage to Whistler Mountain year after year to worship in the hero dirt. The Whistler Bike Park is massive, offering over 4,900 vertical feet of lift-serviced trails. The park is separated into four main zones from the alpine to the valley each offering unique trails, natural features and riding experience. You'll need more than a weekend to take it all in, so plan accordingly! All Levels:The original and still the best, the Fitzsimmons zone runs from the top of the Fitzsimmons Lift to the catch point at Skier’s Plaza right in Whistler Village. Containing trails for all abilities from never-ever to pro plus 5 skills centres, the Fitz is where biking dreams begin. Find famous trails and features like A-Line, B-Line, Dirt Merchant, Canadian Open DH and Crabapple Hits here. Also the site of the Boneyard, constructed new each year for the Red Bull Joyride at Crankworx Whistler. Advanced/Intermediate Riders: A recent introduction to the Whistler Bike Park, riders can now upload from Creekside Village and connect into the bike park at the Raven’s Nest, with trails allowing riders to exit back out to ‘The Creek’ for another lap (or après at Dusty’s). The most ambitious project in the Whistler Bike Park history, the Creekside expansion is well underway. A total of FIVE new trails will be built adding 13 km of delicious downhill to the already generous offerings. New trails will be a mix of machine built and hand built, creating a new combination of the best flow, freeride and technical singletrack that Whistler is famous for. Both the Whistler Mountain Bike Park Trail crew and Gravity Logic will be lending their expertise to crafting the Creekside terrain into a whole new zone. The Creekside Gondola normally opens in June and the trails are anticipated to be ready then – stay tuned for updates as winter progresses. Advanced/Intermediate Riders: Utilising the Garbanzo Lift to sweep riders another 2, 700 vertical feet above the Fitz Zone, Garbanzo has been called ‘the big brother of Fitz’. It demands more of a rider with steeper, higher and technical terrain. Ranging from the progressive jump and flow of Blue Velvet to the rooty, rocky gnar of Goat’s Gully and the higher farther jump trail of Freight Train, this zone has your high level riders coming back year after year. Advanced: Requiring an extra ticket and an extra lift, the Peak Zone is a must-ride zone with a potential descent of 5, 0000 vertical feet from the top of Whistler Peak, with high alpine riding and exceptional views par for the course. The Top of the World Trail has been carefully crafted through the sensitive alpine environment and rider numbers are limited per day and by weather and snow melt – make the most of the opening dates and prepare for a long ride with some of the best views you have ever had. Where’s the seat? Hang on, where are the pedals? 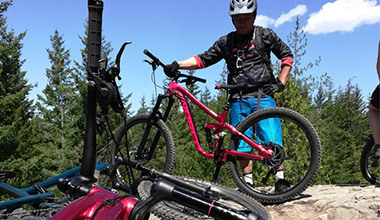 Already a hot sport in Europe, A-rides can now be found on Whistler Mountain Bike Park trails. 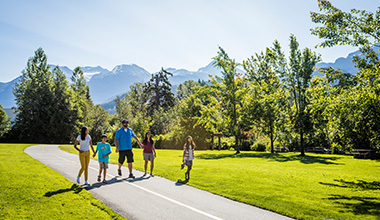 Immerse yourself in pure Whistler biking culture. Mountain bike races, demonstrations, kids events and the classic RedBull Joyride.